Review and reconcile medication and allergy information for wellness and safety – Coming Soon! Pay your Copay bill – Coming Soon! More self-serving activities are coming! Where can you find a Kiosk? Kiosks are conveniently located in VA medical centers and community based outpatient clinics across the U.S. Below is a list of VA facilities where you will find Kiosks. More Kiosks are being added weekly! Most facilities have staff or volunteers dedicated to help guide and assist you in using the Kiosks. Automates certain administrative processes, such as generating forms (e.g., release of information), wristbands and labels (e.g., labs) – coming soon! To log in or use to the Kiosk, you will need to enter your name, SSN and date of birth, or simply use your Veterans’ Health Identification Card (VHIC) to log in. Select the "Check-in for Appointment" option. Use the bar code scanner to read your Veterans Health Identification Card (VHIC). Forget your VHIC? You can also enter your social security number. Enter your date of birth and verify your identity. Update your address, phone number, and personal information using the touchscreen keypad, as needed. Coming to a kiosk near you! No more standing in long lines to pay your copay bills at the medical center! 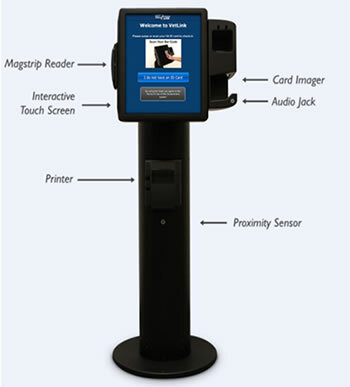 Veterans will soon have another payment option available on the Kiosk to pay their copay bill.